Every bathroom is different. Some bathrooms are large, well-ventilated and used by single people or couples; others are small, have little or no ventilation and are used by families. 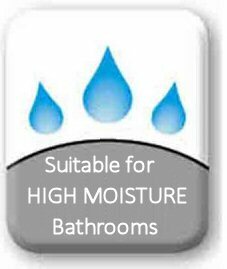 This is why we give a moisture rating to our bath panels, so that you can choose the most appropriate panels for your bathroom. These panels are only suitable for low moisture bathrooms. These are the cheaper panels and made from normal MDF or MFC; they are usually cut from large boards and edged in the same finish as the front. Guarantees on these panels range from 12 months to 5 years. 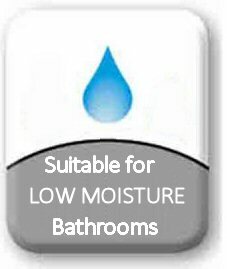 Made from moisture resistant MDF and foil wrapped on the front, these panels are suitable for high moisture bathrooms. The foil wrap is waterproof and applied seamlessly without cutting which means there is no chance of water ingress from the front or edges of the panel. These are favoured by professional bathroom installers / plumbers and guarantees range from 5 years to a lifetime.